You are the content this week. All your questions and your experiences. 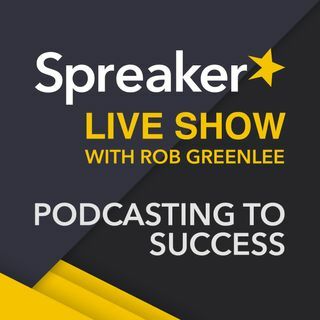 -What does Rob Greenlee REALLY do at Spreaker? I tried i-Tunes but could not get my Apple I.D. to work even two weeks into being on the telephone with support. Rob said he could get it on there for me, but I cannot search to find if it ever made it. For the record I think that Alex and Rob do a great show providing valuable info and entertainment at the same time. Not easy to do. Rob comes prepared with years and years of valuable experience (with amazing detailed outlines) and knowledge regarding Spreaker (btw, he's the head of content) and then podcasting in general. Alex is also knowledgeable but is really filling the role of color commentator a bit more. Does Alex fly off the handle sometimes and maybe lose his place and train of thought? Yes! He has admitted as much. Do I disagree or not understand what he is talking about sometimes? Yes! Am I gonna stop listening? No! The content is too valuable and I think Alex is a good part of that. Rob and Alex have a yin and yang thing going. Besides I'm pretty sure I heard Alex back off his comments about David J. and all is good. I think Alex's comments are good for the show and podcasting in general. It keeps Spreaker LIVE honest. It would be boring if all Alex did was agree and be a yes man to everything. If Rob thinks that Alex goes across a line then I'm sure Rob would say something and maybe even reprimand him or something to that effect. Demerits might be something to consider. Rob I have a million questions for you , but I don't do an interview show just yet so I'll submit my questions one show at a time. This is my Dumbing It Down with Dave Question of the week. Feel free to rename it the Spreaker LIVE question of the week. -ROB: You are the "Head of content" at Spreaker. What does that mean and what do you do exactly? -Is this a full time gig? -What is your Spreaker "head of content" day like? -It sounds like something interesting. -Are you the only employee based in the U.S.? I know you have corresponded with me several times to help me out. -You travel to different shows and conferences representing Spreaker and you also host Spreaker LIVE. -I've been very curious about your job and your workday. Not trying to be nosey. Just curious. - I don't know anyone else who job title is "head of content" Thanks Rob. - I enjoy Spreaker LIVE and I'm always listening even if I'm not always commenting! Yes, Dave Jackson has been on this show. I met Dave through Spreaker Live Show and you through Dave. Neat, huh? I've been trying to make as much of the show automated as possible. The why of the show, the what, and all the call to actions and sponsors. JUST ADDED SPREAKER TO THE LIST ROB! Hope you like it if you ever come by. It has been running about an hour lately, most times a little shorter. how long is this show? Hr? Let me know if you find that you get more views. Thanks Rob, gained a new listener! We also use WordPress blog auto-publish. I manually up-loaded video on You Tube gets way more views than an auto-share from my personal experience. I do both, auto-share from Spreaker and post the link manually in a status. Same results. Facebook will not share us a lot because we are not paying to boost the posts. Slowly stopping your publishing of episodes to your podcast feed. If you go over two weeks, that is generally considered pod fade. Regular AIS is in pod fade, but-----I am providing other things I do to the fans of those on social media. When you are going along pretty regularly with episodes and then all of a sudden you unexpectedly stop.